1. 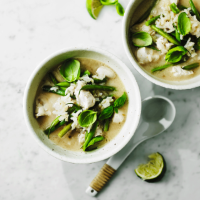 Place the Alpro, chicken stock, lemongrass and curry paste in a large saucepan, bring to a simmer (do not boil), then stir in the rice and cook gently for 12 minutes. 2. Add the chicken and beans and simmer gently for 5-8 minutes until the chicken is cooked through, with no pink meat, and the rice and beans are very tender. 3. Add the fish sauce and squeeze in the juice of the lime, to taste. Ladle into bowls and scatter over basil leaves before serving. Try swapping the green beans for sliced mushrooms.